.Δ———- STATIC SHOCK ♥ MUSIK ———-Δ. 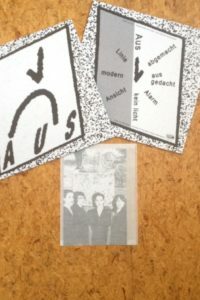 AUS – s/t 12″ is out now ! How does something so vintage sound like such a breath of fresh air?! Berlin’s AUS tap into the Heimatland’s heritage of notoriously cold and humorless nihilism to produce a danceable sense of dread. When the rhythm section isn’t driving us closer to armageddon it’s providing a pounding tribal backdrop for brooding and disaffected witchy incantations. Distant guitars cut like broken glass and the synth rises up through the cracks like a blend of cigarette smoke and fog machine. Night time only record. Collectors take note! : Comes in a heavy 320g sleeve with band photo in hand stamped wax envelope. Night time only record. by Daryl Sulfate, Diät. Static Shock webshop customers please note that any orders placed after midnight on the 6th. January 2017 will not be processed/dispatched until January 18th.2017.You’ll receive your shipping confirmation then. Apologies for any inconvenience this causes.